This is a "closed group" in order to keep politics and other non-veteran or non-association stuff off of the pages. If you use Facebook and want to be a group member just click on the request to join on the upper right hand corner of the page and the page administrator, Ruppert Baird, or I will add you to the group. Once a group member you can use the add friends link to add your 3/4 Cavalry friends to the group. Anyone who has ever served in the 3/4 Cavalry from any era can join the group. Currently we have over 300 former 3/4 Cavalry troopers in the group. If not a facebook user, there is no need to join facebook. It is another tool we can use to get information out to you on our association and other veterans issues. Most importantly, it is an interactive way for you connect with your former comrades from the 3/4 Cavalry. Pass the link on to your 3/4 Cavalry email contacts and post on your own web or Facebook pages. A special thanks goes to Ruppert for setting up the facebook page. 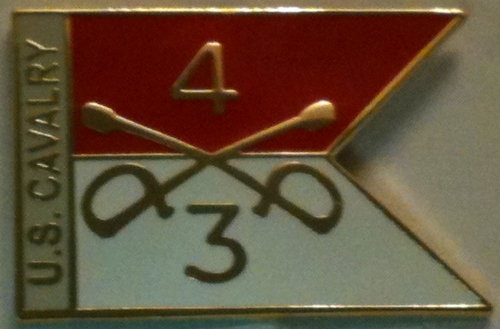 We have added a 3/4 Cavalry Hat Pin/Lapel Pin to the 3/4 Cavalry Chapter Store. This is a unique and beautifully designed item that every trooper will want to own. We have limited quantities in the store so don't delay purchasing one. They will not last long and the cost is only $5.00 which includes free shipping. Please contact us if you have questions. We will have this hat pin/lapel pin available also at the 2012 Nashville Reunion.